Updates | DARD-The Ortho & Cancer Pain Management Centre in Jaipur,DARD-The Ortho & Cancer Pain Management Centre in Jaipur (Rajasthan). 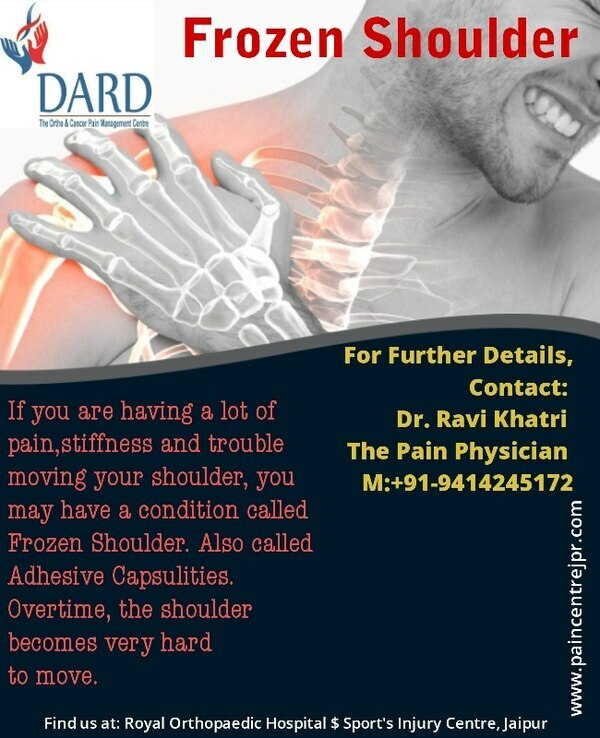 DARD was earlier known as Royal Pain Clinic. 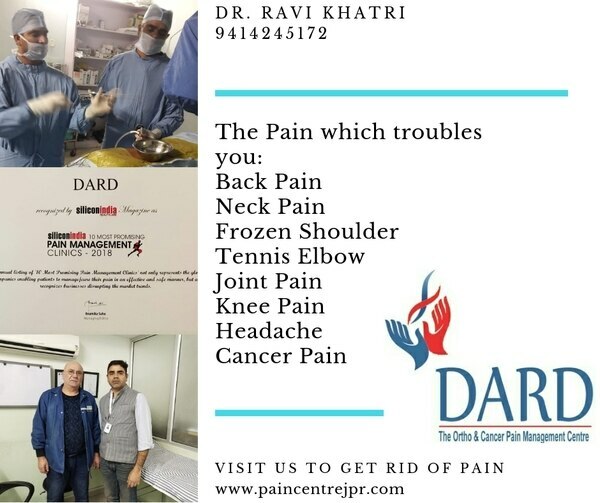 DARD -The Ortho and Cancer Pain Management Centre. It is a leading Jaipur based centre owned by Dr. Ravi Khatri, a renowned Pain Physician and Anesthesiologist. He is expertised in the latest interventional techniques to treat all type of pains. This centre is established with a mission providing best and advanced medical services in pain management. We are a well equipped centre comprising of a team of Interventional Pain Physician and specialised medical professionals with an objective to relieve the pain of Cancer, Spine,Joints and facial and chronic pains by adopting advance and certified medical technology in pain management.The patients suffering from chronic pains(pain more than 2 months) , failed surgery pains and failed to respond to routine medical treatments are well adviced and treated here. We have a panel of medical consultants from different corners across India. We are fully equipped with the medical facilities, advance technology and equipments. We are associated with various Insurance companies and their TPAs. Besides, the Rajasthan Govt. employees and Pentioners can also avail the benefits of Rajasthan Govt. Schemes. We also support BSBY schemes here. 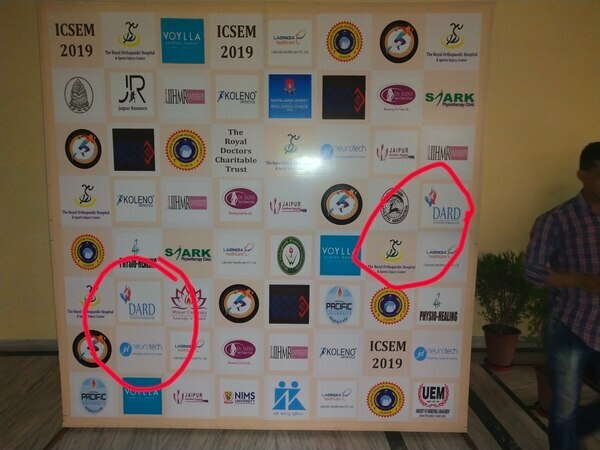 Attended ICSEM 2019 at Birla Auditorium Jaipur on 13/14 April as one of the Organising Secretary/s and Keynote Speaker.My topic was " Advanced Techniques of Pain Management in Sport's Injury : a conservative Approach " . Thanks to Royal Doctors Charitable Trust . 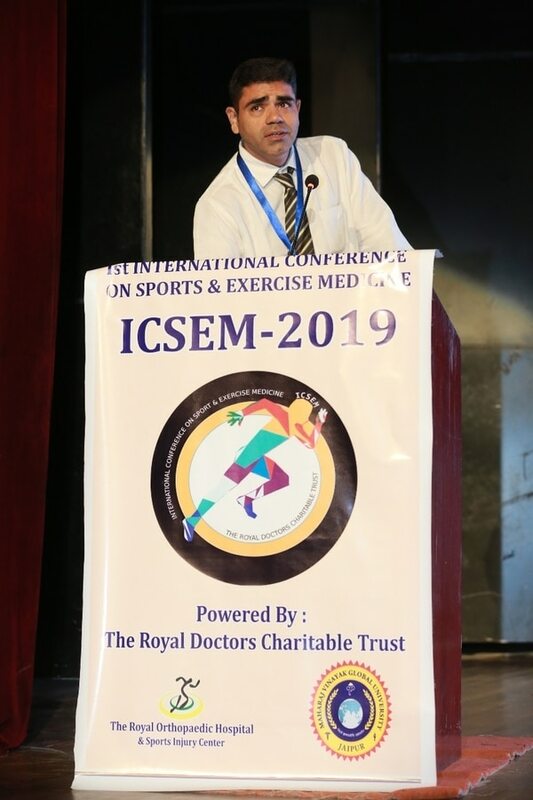 Attended ICSEM 2019( 1st International Conference on Sports and Exercise Medicine) on 13/14 April 2019 at Birla Auditorium Jaipur as one of the Organising Secretaries and Keynote Speaker. 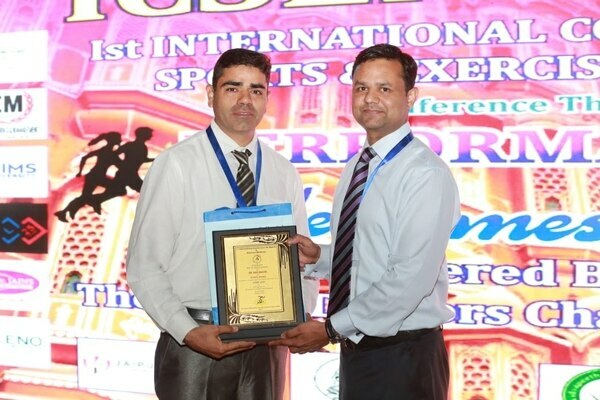 My topic was "Advanced Techniques of Pain Management in Sport's Injury :a Conservative Approach ". It was a tremendous experience to be a part of this 2 day Conference. At a single platform, Meeting big delegates and simultaneously Paying heed to their powerful lectures is niche . They not only imparted their Speech/s comprising of Advanced and Innovative Techniques/ Information about their respective fields but also shared their working (on ground) experience. Besides such delegates, I could be a Speech-Endowed is really a matter of pride for me. Herewith, I want to heartily Congratulate and Thank the man who is the real Originator of the show "Dr. Ashish Mittal" . I don't want to miss the chance to let him know that I will always be there to support him in such kindo wonderful and Great Learning Events holding Great Missions. 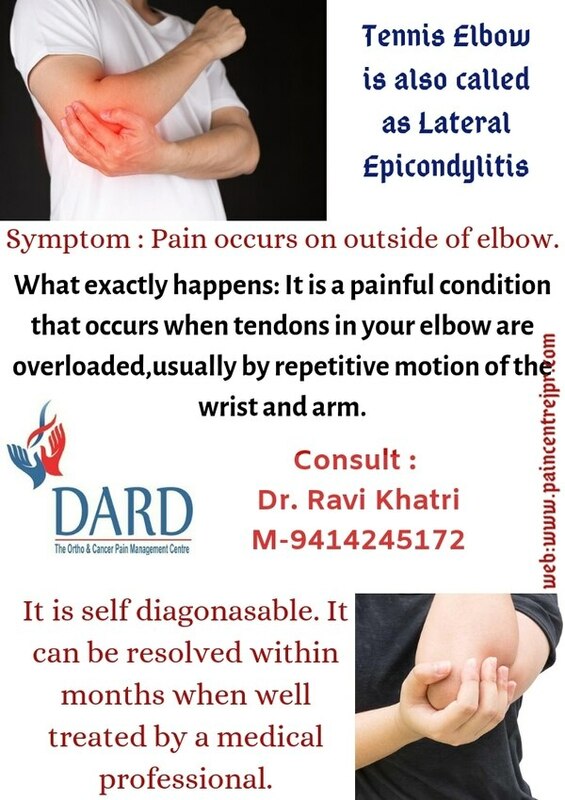 The patients suffering from the problem of Tennis Elbow book your appointment today only for consultancy and treatment. 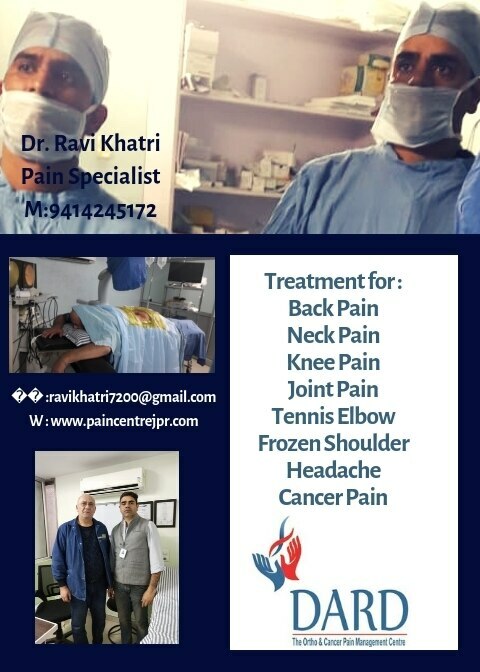 Believe in latest and proven technology of Pain Management .For details and treatment, contact Dr. Ravi Khatri , The Pain Physician, at 9414245172. Book your appointment today. 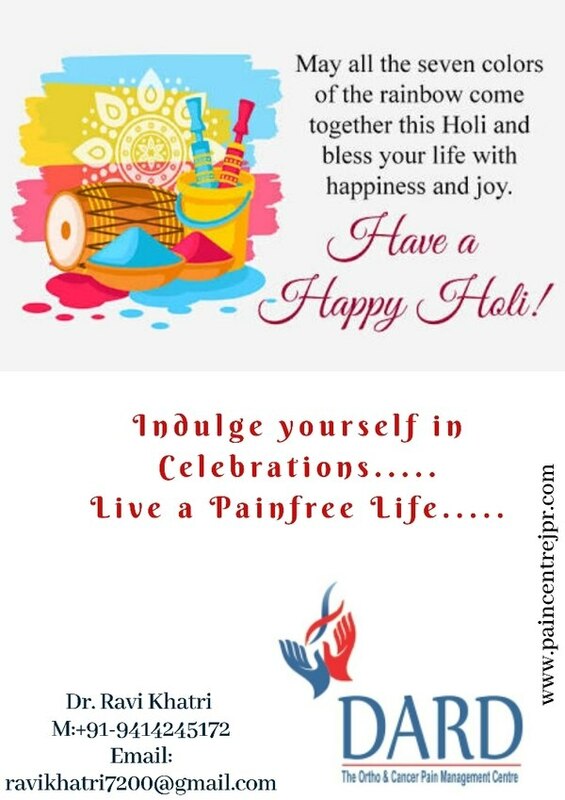 The Entire Team of DARD the Ortho and Cancer Pain Management Centre wishes you a very colourful Happy Holi...!!! Frozen shoulder is a problem which can cease your daily routine work too. It's adviced not to ignore if anyone suffering from this pain. For consultancy and treatment, call us today. Mantra of life: Fitness is a real happiness. 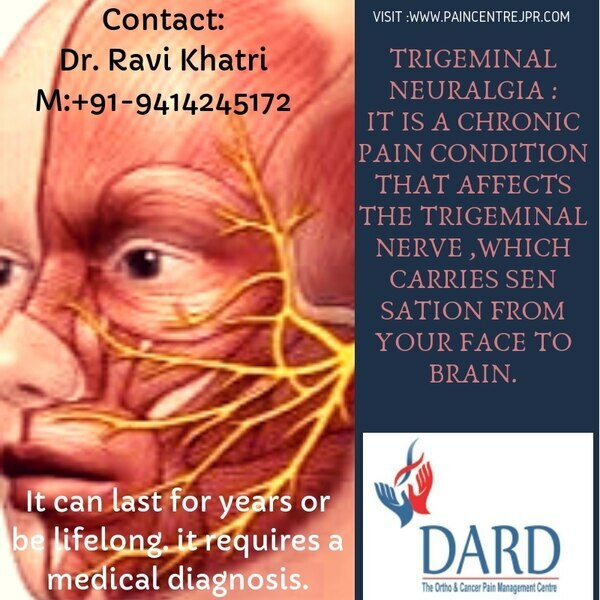 Trigeminal Neuralgia is a condition in which severe pain occurs on face. For further details, please visit our centre at Jaipur (Rajasthan).